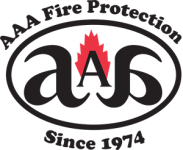 AAA Fire Protection Services is the master at helping Campbell businesses comply with the complex of the California Code of Regulations and Title 8, Section 6151. The good news is that we help businesses just like yours comply by servicing your fire extinguishers every year. What that means is we checked your fire extinguishers to make sure that they work and re-tag them so that compliance agencies can verify that your business is in compliance. In addition, we track when fire extinguishers need to be recharged and whether or not they need to undergo hydrostatic testing. Those are services that are not required every year. In fact, recharging occurs every sixth year and hydrostatic testing occurs every 5- to 12-years as needed. In addition to our comprehensive fire extinguisher services, we offer fire extinguisher sales. We sell fire extinguishers because it's important that businesses have the correct type of fire extinguisher available in the business. If you're ready to work with a professional and expert team, then just give us a call at (800) 543-5556.